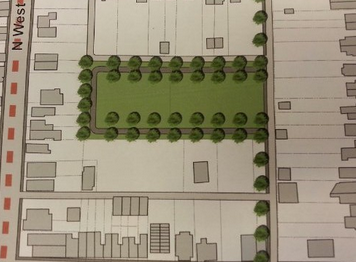 Plans for development, Heberlig Palmer Park. Image found at West Side Neighbors blog. Differently from many other neighborhood and community parks, which oftentimes are built on old farm lands, some of the Heberlig Palmer Park land used to be residential. See below for details on how a collection of five houses and one junk yard became the valued community space it is today. February 25, 1944: Leslie Brown and Lillian M. Brown purchase the junk yard lot for a sum of $1,000 (depicted top left). 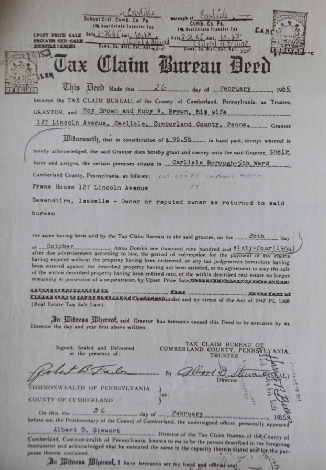 January 21, 1944: James G. Oakley and Earline Oakley purchase the residence at 126 Lincoln Avenue, Carlisle, PA for a sum of $1,000 (depicted top center). 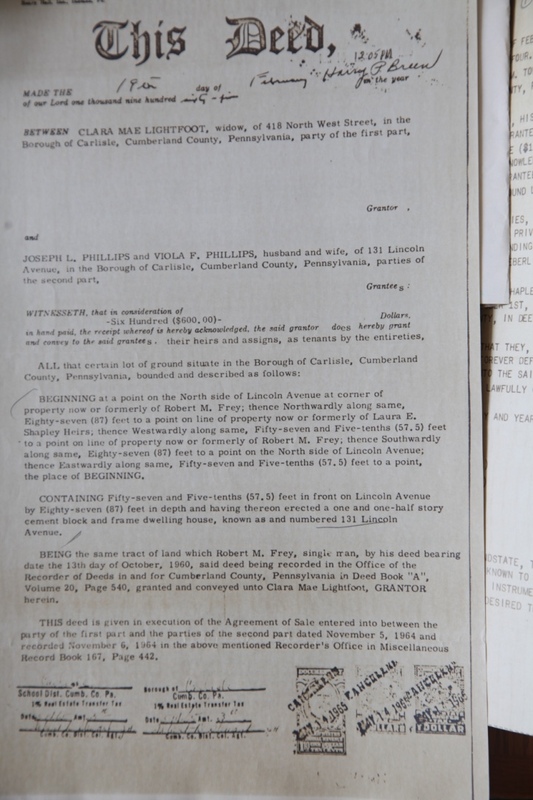 October 26, 1964: Roy Brown and Ruby R. Brown purchase the residence at 327 Lincoln Avenue, Carlisle, PA for a sum of $100 (depicted top right). July 1, 1961: Daskie Wallace purchases the residence at 130 Lincoln Avenue, Carlisle, PA for a sum of $1,800 (depicted bottom left). Deed below, left. 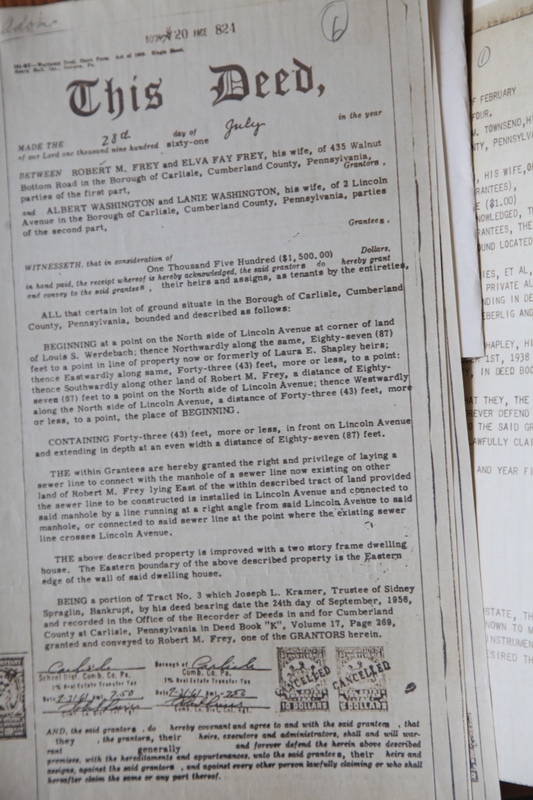 July 28, 1961: Albert Washington and Lanie Washington purchase the residence at 157 Lincoln Avenue, Carlisle, PA for a sum of $1,500 (depicted bottom center). Deed below, center. 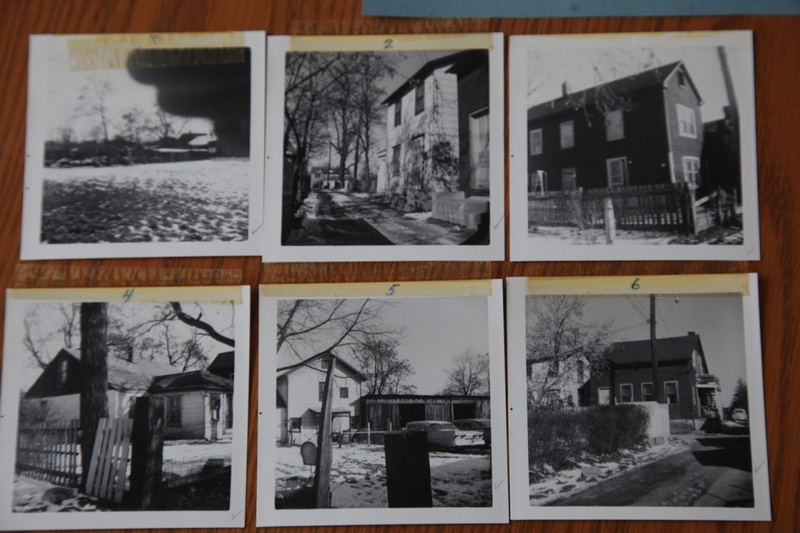 February 19, 1965: Joseph L. Phillips and Viola V. Phillips purchase the residence at 131 Lincoln Avenue, Carlisle, PA for a sum of $600 (depicted bottom right). Deed below, right. 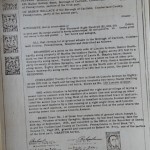 It is unclear when these properties were acquired by the town and demolished to clear a space for a park; however, it is documented that the Brown junk yard lot went into foreclosure on February 26, 1965 (see document below), which transferred the ownership of the lot from the Browns to the town of Carlisle. 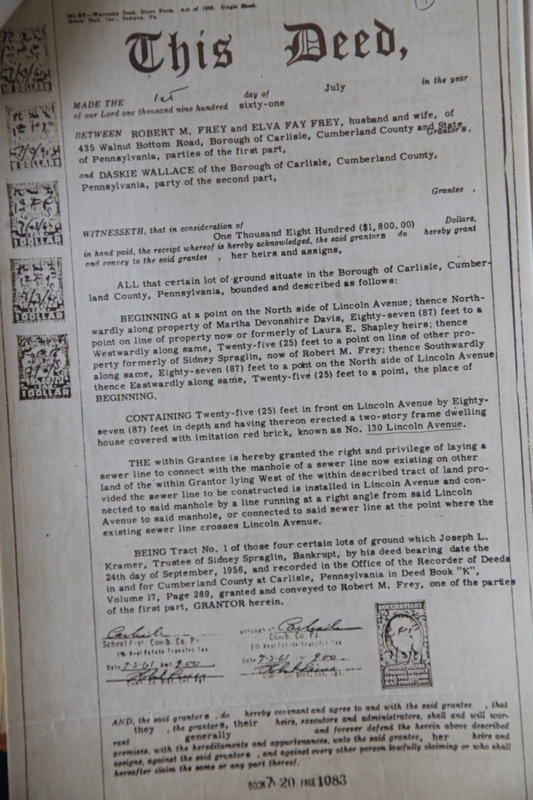 While much is left unknown about Heberlig Palmer Park, the documents and photographs saved by dedicated Carlisle community members over the years provide a picture of how this park came to be. 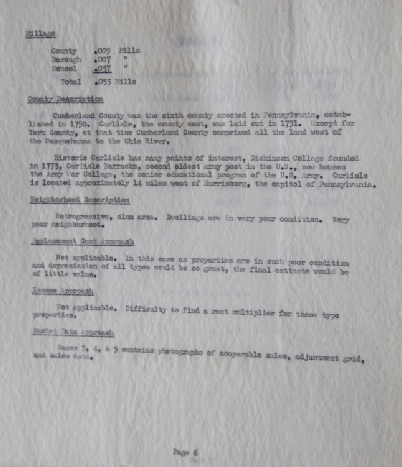 Archived deeds and government paperwork show that the space was considered a slum by a real estate assessor in 1964 (see below). Because of how poor the area was at that time, properties may have been foreclosed or purchased by the town for relatively low costs. 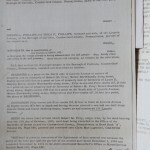 While the process by which this occurred is not certain, by the late 1960s the slum was destined to be revamped, declared to be park land by the borough. This space was cleared, cleaned up and enjoyed by neighborhood children and parents over the next few decades: loyal town resident Melvin Monismith, who has lived in Carlisle, PA for his entire life, recalled playing soccer and other yard games in this “vacant lot,” as he describes it, in the mid-1960s. Interestingly, Mr. Monismith was unaware that the vacant lot he was speaking of had at that time been declared to be a park. The land remained this way until 1997, when donations made by the Redevelopment Authority and the Communities That Care Project made it possible for Cumberland County to purchase soccer goals and benches for the park. This project required a total of $1,800.00 in donations. Following this development, a pavilion was added to the park in the early 2000s — the original pavilion still stands today, with newer developments continuously being built around it (see below). Heberlig Palmer pavilion with 2013 developments around it. Image found at carlislewestside.wordpress.com. From here, many additions have been installed through care and grassroots fundraising, efforts that stand as a testament to the love that Carlislians have for their town. For more information on how the park has developed over the past fifteen years, see Recent and Future Plans . 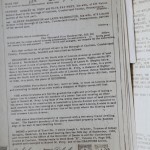 All information and images on this page were retrieved from the Carlisle Parks Department and the West Side Neighbors blog. An informal interview with Melvin Monismith, an interested Carlisle resident, on 18 April 2016 is also quoted above.